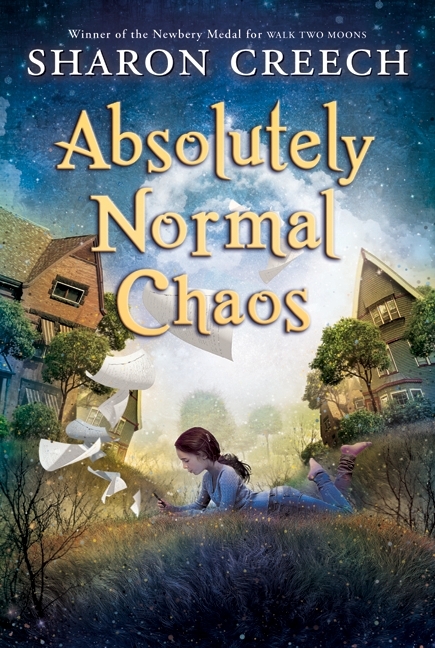 The story Absolutely Normal Chaos by Sharon Creech is my favorite book of all time. I love the main character, Mary Lou Finney. Mary Lou is a 13-year-old girl and has a crazy summer. Mary Lou writes a diary about her summer because her new English teacher asks her to write a journal during the summer. Once she starts writing the journal, she can’t stop. Mary Lou has a huge family of six and things get crazy when her cousin, Carl Ray, comes to live with them for awhile. Carl Ray really comes to visit to find his real father, Mr. Furtz. Mr. Furtz is Mary Lou’s next-door neighbor. While Carl Ray is visiting Mr. Furtz he has a heart attack and dies. But, that’s only a little bit of the drama in the book. You’ll have to read it to find out what happens with the other characters. This book is unique because throughout the whole book Mary Lou is telling the story through writing in a journal. This way of writing helps the reader understand what the writer is thinking, and what the characters are thinking and feeling. This book made me feel like I was actually in the story. I like that feeling, because you get more in the book and want to keep reading. I wouldn’t have changed anything in the story because I liked every part of the book. But, if I had to pick one favorite party of the book it would be when Mary Lou goes on a date with Alex. I recommend it for girls aged eight-years-old to 13-years-old because some things are too sad for younger children, and it might get boring for children over 13-years-old. I think girls would like this book more than boys because it has a lot of parts that relate to young girls and teens.